On Sunday the Philadelphia region's Ukrainian community gathered in prayer to remember the catastrophe at the Soviet-built Chernobyl nuclear power plant. Plast Scouts (front) and Ukrainian Heritage School students (rear) lead a procession. (by David O’Reilly, Philly.com) – Thirty years ago, a safety test at a nuclear power plant in the small city of Pripyat, Ukraine, turned into a disaster that the world, and the Ukrainian people, would not forget. Cooling pumps failed. The reactor cores surged and exploded, blowing off the building’s roof. 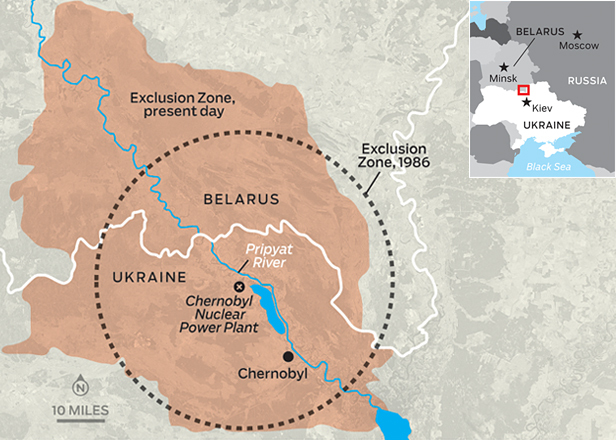 For nine days the ensuing meltdown at the power plant called Chernobyl spewed radioactive gases for miles around, forcing the eventual relocation of 120,000 residents. On Sunday the Philadelphia region’s Ukrainian community gathered in prayer to remember the catastrophe at the Soviet-built plant, and to mourn Russia’s recent war on their nation of origin. “Today we are gathered in solidarity to mark the tragedy of Chernobyl and to stand with the people of Ukraine,” Ulana Mazurkevich, president of the Ukrainian Community Committee of Philadelphia, told the 400 people gathered at the Ukrainian Catholic Cathedral of the Immaculate Conception in Northern Liberties. The 90-minute service, which began with a procession and wreath-laying and ended with a release of white doves, included Catholic, Orthodox and Protestant speakers and many traditional songs and prayers. Most of the program was in Ukrainian. Among the speakers was Valeriy Chaly, Ukraine’s ambassador to the United States. He drew parallels between the nuclear plant meltdown that began April 26, 1986 and the Russian invasion and annexation [take-over] of Ukraine’s Crimean region in 2014. “Chernobyl is very connected with the same kind of Soviet arrogance and aggression we are seeing now,” Chaly said in an interview before the service. The Russian incursion “comes from the same Soviet style of thinking and culture,” Chaly said. “It’s an attempt to bring us into their empire,” he said. Like several of the program’s other speakers, Chaly said the people of Ukraine need financial and medical donations to cope with the consequences of the current conflict. The service, while melancholy at times, was also a celebration of Ukrainian culture, with many of the participants wearing the region’s traditional dress. Small girls wore white skirts and floral headdresses, some boys wore bloused satin pantaloons, and several men – including Chaly – wore vyshyvankas, or collarless embroidered shirts. The enormous cathedral, which features a gilded dome visible for miles, also resonates with imagery familiar to most Ukrainians. An enormous mosaic of Mary rises above the altar, which sits behind a soaring wood iconostasis, or altar screen, bearing dozens of gilded icons of saints and Jesus. “We ask our Lord and Savior to remember those who perished as a result of the catastrophe,” a teenage girl read in remarks before the altar screen. Ukraine’s has been “a history full of tragic events,” she said. Much of the singing was accompanied by violins or traditional musical instruments. “That is the bandura,” an elderly woman explained, wiping away tears as she pointed to the broad, stringed instruments that two women played on the dais. Nataliya Turchyn, 45, told a visitor before the service that she was 15, living in the western Ukraine city of Lviv, when the Chernobyl plant exploded. Four days later, the nation’s Communist leadership ordered all citizens to partake in traditional outdoor May Day celebrations, even though untold amounts of radiation were raining down on the nation. Reprinted here for educational purposes only. May not be reproduced on other websites without permission from The Philadelphia Inquirer. Visit the website at philly .com. 1. a) Where is Chernobyl? b) What was the Chernobyl disaster? c) Why is Russia associated with the Chernobyl disaster in Ukraine? 2. How did Ukrainian-Americans commemorate the disaster in Philadelphia on Sunday? Be specific. 3. What did Valeriy Chaly, Ukraine’s ambassador to the U.S. say about the parallels between the Chernobyl disaster and Russia’s invasion and take-over of Ukraine’s Crimea region? 4. Two of the speakers at the commemoration were teenagers. What did each say about the disaster and Ukraine? 5. Why did Ukrainian-Anerican Nataliya Turchyn say Ukrainians did not trust Russia after the Chernobyl disaster? a) Ask a parent: Do you agree with their sentiments? Please explain your answer. b) Which presidential candidate do you think will best be able to deal with President Vladimir Putin of Russia? Explain your answer. c) Ask your parent the same question. OPTIONAL: Ask a parent or grandparent what he/she remembers about the Chernobyl disaster. The Chernobyl disaster was a nuclear accident of catastrophic proportions that occurred on April 26, 1986, at the Chernobyl Nuclear Power Plant in Ukraine (then in the Ukrainian Soviet Socialist Republic, part of the Communist Soviet Union [USSR]). — In 1922, Ukraine became one of the original constituent republics of the Union of Soviet Socialist Republics (USSR. ); it would not regain its independence until the USSR’s collapse in 1991. At 1:23 a.m. on April 26, 1986, reactor No. 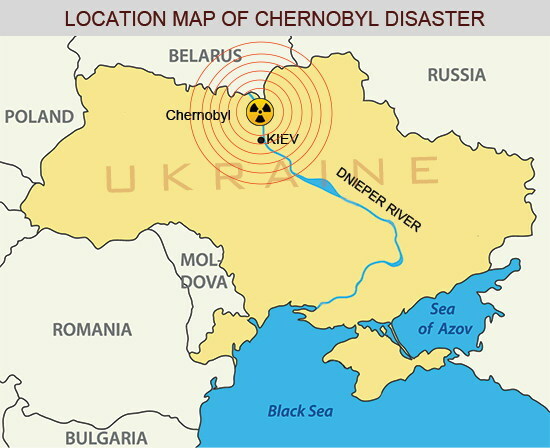 4 of the Chernobyl nuclear power plant, about 30 kilometers (62 miles) north of Kiev, exploded during a safety test. For 10 terrifying days, the nuclear fuel kept burning, spewing clouds of poisonous radiation that contaminated up to three-quarters of Europe, with Ukraine and neighboring Belarus and Russia hit especially hard. As the horror unfolded, the Soviet authorities said nothing publicly, in keeping with a tradition of preventing people from learning of tragedies that could tarnish the image of the Cold War-era superpower. They evacuated the 48,000 inhabitants of the town of Pripyat, located just 3 kilometers (1.8 miles) from the plant, only the following afternoon. The first alarm was raised on April 28 by Sweden, which detected an unexplained rise in its own radiation levels. In his second year on the job, the leader of Russia, Communist Party Secretary-General Mikhail Gorbachev, did not publicly admit the disaster until May 14. With the scale of what had happened now out in the open, the authorities in 1986 relocated 116,000 people from the 30-km Exclusion Zone that surrounds the now-idled plant. Subsequent years saw 230,000 others experience the same fate [relocation]. Yet 5 million Ukrainians, Belarusians and Russians still live in areas where radiation levels are high.